It was once a fad among New Yorkers vacationing in Florida to bring back baby alligators for their children to raise as pets. These infant gators eventually grew up and outlived their cuteness, sad to say, at which point their desperate owners flushed them down the toilet to get rid of them. Some of these hastily disposed of saurians managed to survive and breed in the dank Manhattan sewer system, so the story goes, producing colonies of giant, albino alligators beneath the streets of New York City. Their descendants thrive down there to this day, completely hidden — apart from the rare heart-stopping encounter between sewer gator and sewer worker, that is — from human eyes. I love this story as much as the next guy, but it's folklore, not fact. Herpetologists pooh-pooh the very idea of alligators thriving in the New York City sewer system. 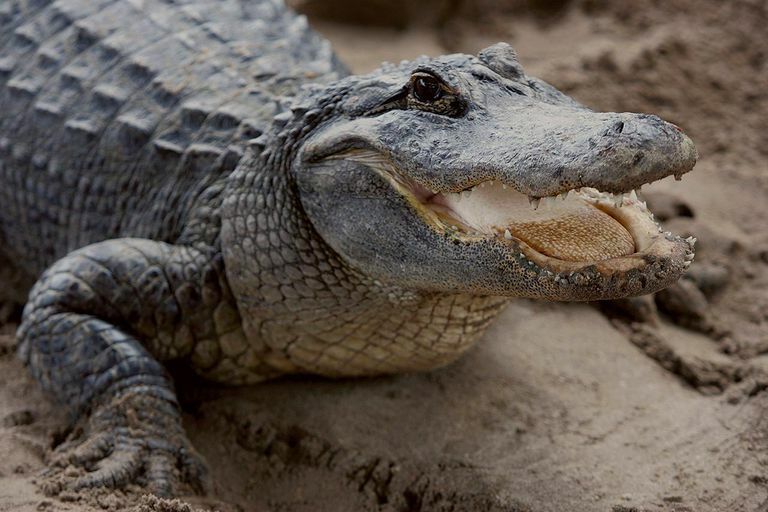 It's cold down there most of the time, they point out — freezing cold during the winter — and alligators require a warm environment year-round to survive, much less reproduce and burgeon into colonies. If the cold weather didn't kill them off, the polluted sewer water certainly would. There's a grain of truth at the heart of this decades-old urban legend, however, namely the documented capture of an eight-foot-long alligator at the bottom of an East Harlem manhole in 1935 — though no one at the time assumed the creature actually lived down there. Instead, it was theorized that the 'gator probably tumbled off a steamer visiting the northeast "from the mysterious Everglades, or thereabouts," then swam up the Harlem River. It met an unfortunate end at the hands of the teenage boys who found it. The earliest published reference to alligators in the sewer — in what Jan Harold Brunvand refers to as the "standardized" form of the urban legend ("baby alligator pets, flushed, thrived in sewers") — can be found in the 1959 book, The World Beneath the City, a history of public utilities in New York City written by Robert Daley. Daley's source was a retired sewer official named Teddy May, who claimed that during his tenure in the 1930s he personally investigated workers' reports of subterranean saurians and saw a colony of them with his own eyes. He also claimed to have supervised their eradication. May was a colorful storyteller, if not a particularly reliable one. The tale was well known throughout the United States by the late 1960s, when, according to folklorist Richard M. Dorson, it came to be associated with another icon of sewer lore, the mythical "New York White" — an especially potent, albino strain of marijuana growing wild from seeds spilled out of baggies hastily flushed down toilets during drug raids. Not that anyone had ever actually seen the stuff, much less smoked it. It was impossible to harvest, you see, because of all the alligators down there. • November 2006 - A two-foot-long caiman is captured outside an apartment building in Brooklyn. Police say it "snapped and hissed" at them. • August 2010 - A two-foot-long alligator was captured in Queens after eyewitnesses spotted it hiding under a parked car. The Straight Dope's Cecil Adams doesn't think so. An interview with herpetologist Frank Indiviglio, who says alligators couldn't survive in the New York sewer system. Commentary by Barbara Mikkelson for the Urban Legends Reference Pages. New York Daily News: Lengthy feature covering some of the most urban of urban legends, including sewer 'gators. Brunvand, Jan H. Too Good to Be True: The Colossal Book of Urban Legends. New York: W.W. Norton, 1999, pp. 182-185. Brunvand, Jan H. The Vanishing Hitchhiker: American Urban Legends and Their Meanings. New York: W.W. Norton, 1981, pp. 90-98. Coleman, Loren. "Alligators-in-the-Sewers: A Journalistic Origin." Journal of American Folklore 92 (1979): 335-338. Daley, Robert. The World Beneath the City. Philadelphia: Lippincott, 1959, pp. 187-189. Dorson, Richard M. America in Legend. New York: Pantheon Books, 1973, pp. 291-292.